For a few seasons now dynasty owners have been on the edge of their seats awaiting the inevitable news of the retirement of Rob Gronkowski. Gronk has left a legendary impact on the game of football both on and off the field. Rob Gronkowski put together one of the best careers for a second round pick who many NFL teams doubted due to him missing 16 games in his final two seasons at the University of Arizona. Gronk spent all nine NFL seasons with Tom Brady and the New England Patriots posting 521 receptions for 7,861 receiving yards and 79 receiving TDs. The 79 touchdowns by Gronk are the most in the NFL for any player since he was drafted in 2010. The most dominant stat I found on Gronk were his playoff numbers not only was he a major part of making it to five Super Bowls with the Patriots and winning three of them but his numbers were just insane. We will get into the G.O.A.T conversation later in this article but one thing that is not up for debate is Gronk being the best postseason TE of all time. In 16 career playoff games Gronk stock piled 81 receptions for 1,163 receiving yards and hauled in 12 receiving touchdowns. Gronk is number one in all three of these categories. One thing that stings dynasty owners the most when you are holding onto old veteran players is the immediate loss of dynasty value. In my experience as a dynasty player there’s been instances where you can’t predict the future of a player and the immediate loss of value can really take a toll on your team. In most cases when you are rostering older players it’s easier to deal with but when you have examples such as Calvin Johnson and now Gronk who have walked away when they still are putting up big fantasy numbers it makes filling that void they left extremely difficult in a short period of time. 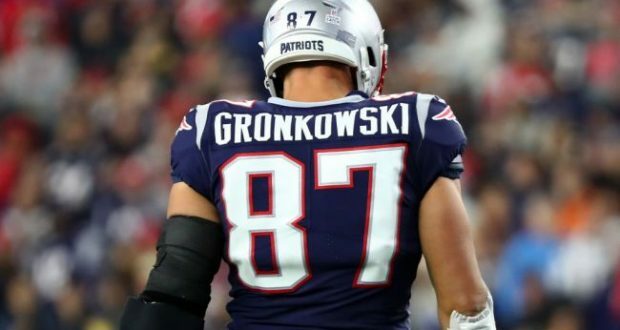 Although most dynasty player were aware of the impending retirement of Gronk it still tough when it becomes a reality we have to remember just a year ago in redraft leagues he was still being drafted as the TE1 overall. 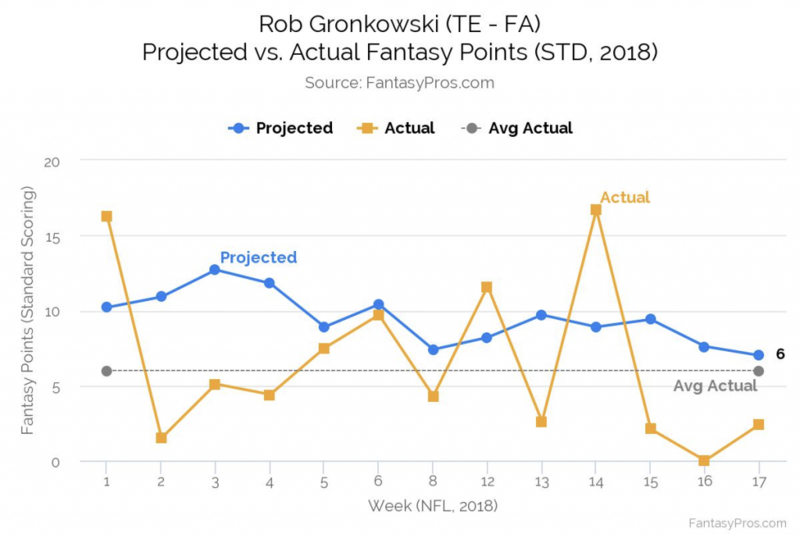 Even in his last season who many will see as a disappointment as you can see in the chart below from fantasypros.com Gronk still finished as the TE11 in PPR leagues in 2018. Although 2018 didn’t go as planned for fantasy owners who had high hopes for Gronk, more often than not he carried dynasty teams. 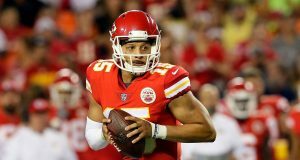 FantasyPros posted a interesting chart of the projected vs actual fantasy points in 2018. Clearly this wasn’t his best season but Gronk still averaged 10.1 fantasy points per game. This was the lowest fantasy points per game for the future hall of fame TE since his rookie year in 2010 when he averaged 9.8. The frustration for most dynasty owners of Rob Gronkowski over the years has been his injuries. For good reason as you can see Gronk has only played 16 games twice in his career both were his first two years in the league. 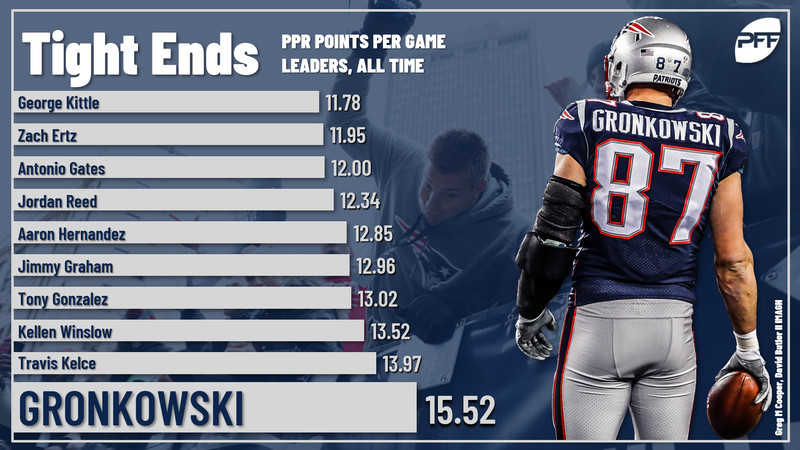 Gronk had over 100 targets four times in his nine year career, in each of those seasons he averaged over 17 fantasy points per game with his career best coming in 2011 when he averaged over 20 FPPG. Amazingly in his nine seasons played Gronk had less than 8 touchdowns only three times. 2011 was a career best for Gronk he hauled in a NFL record 17 touchdowns while also posting a catch rate of 72.6% also a career best. In his 116 games played he scored 80 touchdowns and in true “Gronk” fashion he averaged .69 touchdowns per game. I wouldn’t be surprised if he did this on purpose for the record. Gronk retires as the Patriots all time leader in touchdown receptions (79) passing former Patriots wide receiver Stanley Morgan in 65 fewer games. Gronk ranks 1st in touchdowns, 2nd in yards and 4th in yards per game in his career as a New England Patriots. Instant reaction around social media seemed to be that Gronk is the greatest TE of all time. Although that’s not exactly what this article is about I’d regret it if I at least speak to that. The debate seems to be longevity vs record-breaking prime. It is an interesting topic for dynasty players. Would you rather have the dominance of Gronk and Calvin Johnson in their prime or the longevity of Tony Gonzalez or Tim Brown? The numbers are interesting and while I would take the consistency and longevity it’s very hard to disagree with anyone who wants the dominant player in their prime. Tight ends overall in fantasy football have never been valuable when Gronk burst onto the scene in a way this changed. Dynasty owners still to a degree don’t value the TE position but after Gronk’s 2011 season it at least put the idea of having a huge positional advantage on people’s radar. Even though Antonio Gates is responsible for three of the five best fantasy TE seasons of all time Gronk holds the best ever with his 2011 season. That 2011 season was truly incredible, Gronkowski had 90 receptions, 1,327 yards, and caught 17 touchdown passes. The most incredible stat of that season is that Gronk outscored every WR not named Calvin Johnson. 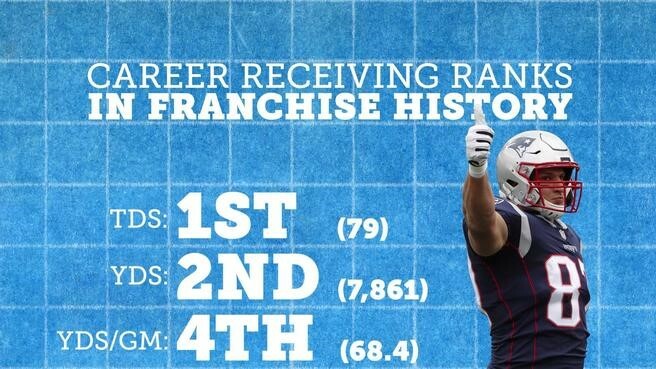 Even though Gronk played another seven seasons after 2011 he never had another season that good. Unfortunately for most fantasy football players Gronk never out performed his ADP again in his nine year career his ADP reached an insane level after his three biggest seasons. Gronk’s ADP was 19.7 in 2012, 11.9 in 2015 and 13.9 in 2016. Now while these numbers are based on redraft leagues I’ve been apart of many dynasty discussions around Gronk being a first round startup pick during this time. 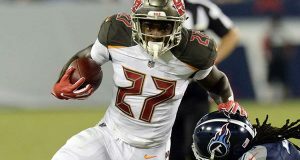 Pro Football Focus has posted many interesting stats of the recently retired TE. 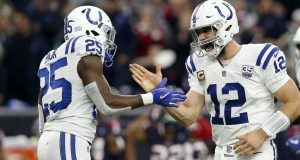 PFF has given the combo of Tom Brady and Rob Gronkowski the best grade since 2006 of a quarterback to receiver with grade of 129.6. An amazing stat on Gronk is how he averaged a touchdown every 6.6 receptions. Even if you think Gronk wasn’t worth the risk to own him during his prime or you don’t believe he is the best TE of all time you have to respect his greatness as a dominant force from a fantasy perspective. According to PFF he holds the greatest PPR points per game of all time for a TE. It’s worth noting that five of the 10 players on this list are all still active which really shows how the evolution of the TE position in fantasy football leagues. This one pains me slightly as a Bills fan living in Buffalo, New York. The one team that Gronk punished the most in his career was the Buffalo Bills.In 15 games played Gronkowski has scored 12 touchdowns, the most he’s had vs any team in his career. 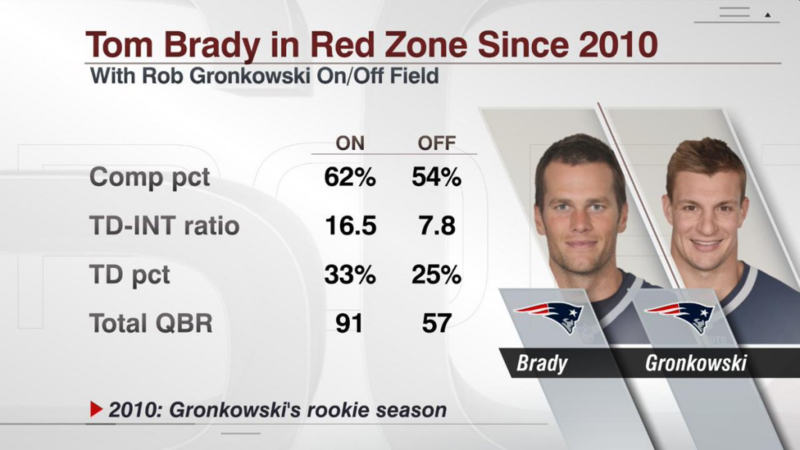 Since entering the NFL in 2010 the impact Gronk has had on the success of Tom Brady and the Patriots is remarkable. Tom Brady has played 115 games with Gronk and 29 without since 2010, in those games with him he averaged more touchdowns, completions, passing yards per game, yards per attempt and averaged a higher completion percentage. In the 29 games without his star TE, Brady’s numbers were much worse while averaging more passing attempts. I truly believe Rob Gronkowski has extended Tom Brady’s career at least three seasons and his dominance in both the run and pass game might be something we won’t truly appreciate until he’s officially gone. Dynasty owners who have hung on for the ride of owning Gronk over the years have to come to a tough decision as draft season approaches. Do you cut or trade Gronk for the roster spot? As an owner in this situation in more than one league, I am holding for now. It’s hard to believe for me that he won’t at some point be back in a Patriots uniform this season. The connection between Tom Brady and Rob Gronkowski is special and as NFL agent, Drew Rosenhaus has stated that Gronk would come back if his QB called him up and asked. The Patriots don’t seem to have a short term answer for the retirement of their star TE and according to reports the Patriots were “surprised” by his decision. The 2019 TE draft class is very deep and very talented it would make sense for the Patriots to draft one or two with one of their 12 draft picks. 2018 wasn’t a great ending for dynasty owners to remember Gronk by but the fact remains if he does at some point play again the allure of putting Gronk back in your starting lineup will be too enticing to resist. If this is the end for Gronk it was truly an honor watching him play. Three Lombardi trophies, five pro bowls, four first team all pros and the greatest postseason TE of all time title under his belt I just wanna say thank you GRONK!